Creep feeding is recommended for accelerated lambing and kidding programs, in flocks and herds where there are a lot of multiple births, and anytime milk production is a limiting factor. Artificially-reared lambs and kids should be creep fed to facilitate early weaning. Creep feeding is also advisable when pasture quality or quantity is lacking. Lambs and kids that are creep-fed will almost always grow faster than those that are not, especially if grain is the source of supplemental nutrition. Faster growth means lambs and kids can be marketed younger and sooner, often in time for high demand periods (e.g. Orthodox Easter). Creep feeding teaches young animals to eat. It reduces the stress of early weaning. The rumens of creep-fed lambs and kids will develop faster. I’ve seen three week old lambs chewing their cuds. It is always more economical to feed lambs and kids than does and ewes. A young lamb or kid converts feed to gain very efficiently. The extra nutrition (especially protein) may help to improve tolerence to internal parasites. Creep feeding does not need to be complicated. A “creep area” may be set up in the barn or out on pasture. The creep barrier needs to be big enough for lambs to fit through, but small enough to keep even the smallest ewe out. A tire can be used as a creep barrier. Some gates have big enough openings that kid goats can slip through. The creep area should be clean and well-bedded, an area where the lambs and kids will like to go. Creep feed may be fed in troughs or self-feeders. Good creep feeders don’t allow lambs or kids to play on (or in) or put their feet in the feeders. Creep rations don’t need to be complicated — just fresh, palatable, always available, and highly digestible. Typical feed ingredients are ground or cracked corn, alfalfa hay or meal, soybean meal, oats, and molasses. The percent protein in the creep ration should be at least 14% – 18%. The protein should be all-natural (no urea). It is recommended that lambs and kids be introduced to creep feed early in life, ideally by the time they are 10 days old. You can make your own creep ration or purchase a commercial product. On my farm, I start with a mixture of soybean meal, cracked corn, and minerals. Some producers use straight soybean meal for their creep starter or top-dress their creep ration with it. Soybean meal is very palatable to young lambs and kids. As my lambs get older and begin chewing their cuds, I gradually switch their creep ration to whole barley and a pelleted protein supplement. When lambs are young, feeds with a small particle size are more palatable to them. As they get older, they prefer coarser feeds and are able to digest whole grains very efficiently. The protein content of the ration can be reduced as the lambs get older. For disease prevention, it is a good idea to include a coccidiostat (Bovatec®, Rumensin®, or Deccox®) and urine acidifier (e.g. ammonium chloride) in the creep ration. The ratio of calcium to phosphorus should be at least 2:1 to prevent urinary calculi in male lambs and kids. Creep-fed lambs and kids are more susceptible to enterotoxemia, “classical” overeating disease (clostridium perfringins type D). Their dams should be vaccinated approximately one month before parturition. 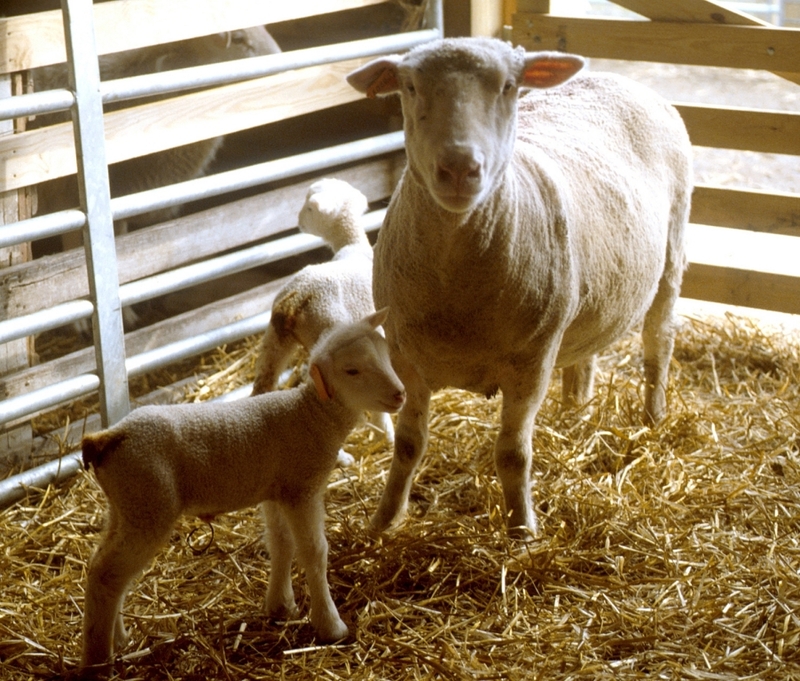 Lambs and kids should be vaccinated after their colostrial immunity wanes, at approximately 6-8 and 10-12 weeks of age. 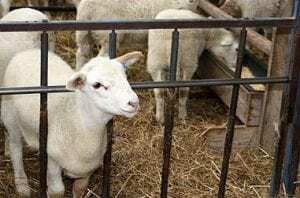 Lambs and kids from unvaccinated dams should receive their first vaccination for overeating disease when they approximately four weeks old, followed by a booster four weeks later. Earlier vaccines are not likely to be effective due to the immature immune system of young lambs and kids and interference of the maternal antibodies. Overeating disease most commonly affects the fastest growing lambs and kids, usually past a month of age. Creep feeding is a common practice in the sheep and goat industry. All producers need to evaluate the appropriateness of the practice for their production and marketing systems. For creep feeding to be economical, the higher value (extra weight and higher prices) of creep-fed lambs and kids needs to exceed the cost of the creep feed. Creep feeding may not always be economical, especially on farms with high quality forage. Creep feeding is more likely to be cost-effective with lambs than goats. Posted by Braden Campbell at 8:00am December 19, 2018 Posted in Nutrition and tagged Management, Nutrition. Bookmark the permalink.